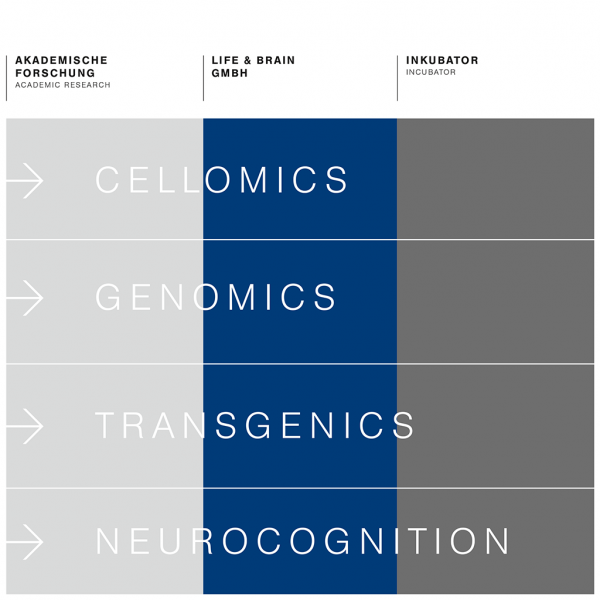 Closing the gap between university research and business – this is the rationale behind the biomedical and neuroscientific technology platform LIFE & BRAIN. In academia, translational developments frequently get stuck at an early stage because insufficient know-how and lack of financial resources prevent the development of a proof of concept required for further downstream commercialization and market entry. As a Bonn-based company specialising in translational university medicine, LIFE & BRAIN acts as a ‘revolving door’ between academic research and industry. Innovative research findings are recognized early and developed further into marketable biomedical products and services. Our expertise in the fields of genome research, stem cell technology, transgenic modelling and neurocognition creates the perfect environment for designing future-oriented services and products for disease-related research and the development of novel therapies. The Translation Centre LIFE & BRAIN has a unique structure within Germany where over 250 scientists and researchers work together under one roof in four R&D platforms. Novel approaches are typically conceived by academic staff. The development from idea to marketable product is carried out in-house with the support of staff experienced in intellectual property, licensing, business development and funding opportunities. This enables our scientists to develop their business ideas while continuing their academic career.